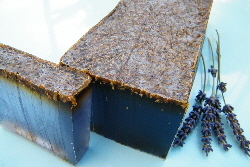 Handmade soap hand crafted in the UK with a strong lavender fragrance and real dried lavender. 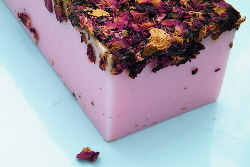 Soap slab and slices in rose fragrance with real dried rose petals. Handmade soap made with natural ingredients can be so luxurious. Why not try making your own using a melt and pour kit from a craft shop, then just add your own finishing touches like a sprinkle of dried lavender. It is also to make handmade soap from scratch but beware the ingredients are hazardous and you must use safety precautions. Handmade soaps can be made with olive oil as the main ingredient, which is excellent for the skin. It attracts external moisture and holds it to the skin forming a breathable barrier without affecting the skins natural functions. Other natural oils such as palm oil (which adds creaminess to the lather), jojoba and coconut oil can also be used depending on the recipe. Another ingredient in some soaps is grapefruit seed extract which is a natural antioxidant. 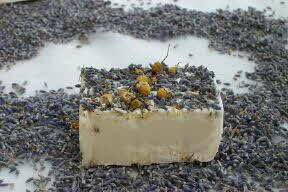 Handmade soap - lavender fragranced with lavender essential oil and decorated with dried lavender and chamomile flowers from our dried flowers selection. Try making handmade soap in rose fragrance and decorating it with dried rose petals like the one in the picture above. You could also try topping it with dried rose buds. Not just dried lavender and roses! Apart from dried lavender, other dried flowers suitable for making handmade soap might be Christmas spices such as crushed cinnamon sticks.